First, Create two new databases called DBPri and DBSec. DBPri is the Publication database. DBSec is the Subscriber database. At this point the two tables are out of synch. "Distribution to Subscriber History" tab. First, it will show a status = "Running" with Action Message: "Error executing a batch of commands. replicated command. (Source: MSSQLServer, Error number: 20598)"
At this point no Transactions are being replicated at all from Distributor to Subscriber database. The system is down. #1. Using Replication Monitor, get the Transaction Sequence Number AND the Command ID. You should also check the how many transactions are in Distribution waiting to be sent to Subscriber. You do this by checking the watermark. indicates the # of transactions waiting in Distribution DB. #2. Using below T-SQL, w/ Transaction Sequence Number as input, locate the actual command is causing the error. was trying to update a field to value = Jimmy. would then succeed and replication would resume functioning. There may be other rows that are missing and that have to be manually inserted (or deleted) at the subscriber if there are more failures. can stop Distribution Agent and make sure your table(s) is 100% synced. Then remove the -SkipErrors parameter. sp_publication_validation and get a row count check and checksum check to confirm you are 100% synced. Job. That is a good short-term fix IF you needed Transactional Replication running as soon as possible. Transactional Replication will stop functioning. Make sure you know exactly what the effects are BEFORE using this parameter. 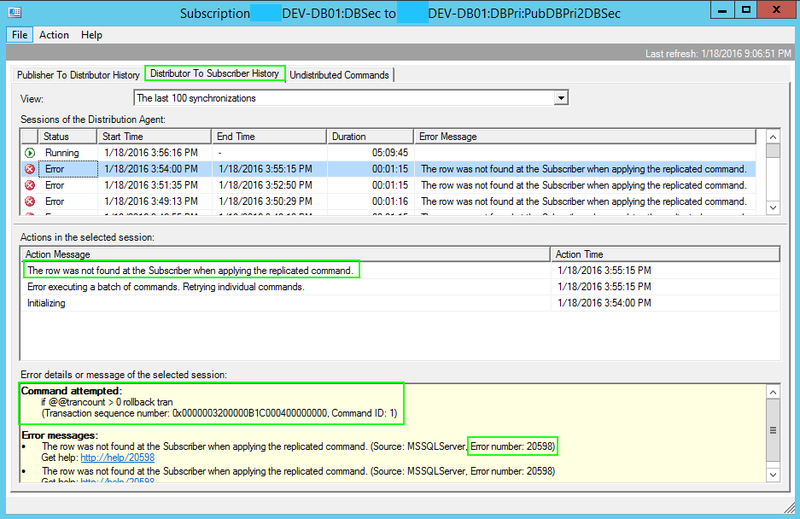 How to troubleshoot error 20598 "The row was not found at the Subscriber when applying the replicated command"
SQL Job check on error "The row was not found at the Subscriber when applying the replicated command"